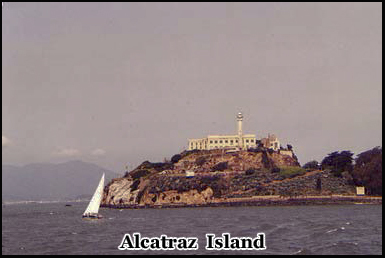 In the 1850’s haunted Alcatraz Island was first used as a military fortress. It also became a prison, holding deserters captured during the civil war, as well as American Indians. In the 1930’s J. Edgar Hoover, decided that a maximum security prison was needed to hold some of the era’s most notorious criminals. 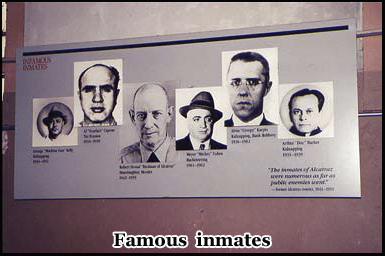 Under the supervision of Warden James A. Johnston, inmates included, Al Capone, Machine Gun Kelly, and Robert Stroud, also known as the Birdman of Alcatraz. 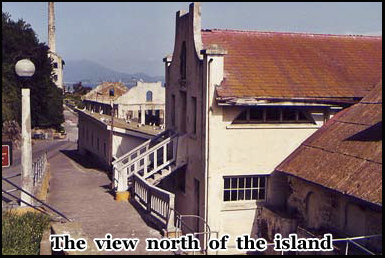 During its lifetime the island, survived a siege by United States Marines, numerous escape attempts, several suicides, and countless acts of violence committed by both guards and inmates. In 1963 Alcatraz closed its doors. Ten years later it was opened to the public and has become one of San Francisco’s top tourist attractions. But its long and bloody history seems to have lived on. There have been strange and unexplained occurrences reported by both visitors and employee’s since its closure. And it seems that for many of the inmates there was no escape, even after death. I drove up from San Jose, to San Francisco having visited the Winchester mystery house on the previous evening. I arrived at 8 a.m. 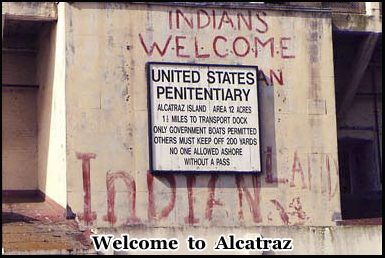 It is important to book the Alcatraz Island tour in advance, as it can be full for weeks ahead of time. I highly recommend the first tour in the morning, which leaves for the island at 9 a.m. The reason for this is that by mid day the island becomes extremely crowded, and it loses much of its atmosphere, particularly if one of your reasons for going is to experience the scene of the ghostly occurrence’s that many people over the years have reported. Being on the first tour boat over, gave me the opportunity to visit many areas of the prison, and be the only person there. Being able to do this, instead of being surrounded by dozens of people, is the difference between being able to experience what is a extremely eerie atmosphere, or being merely just another tourist. You may not see a ghost, but you actually feel that you might. Alcatraz is about a mile away from Fisherman’s Wharf across the San Francisco bay. But if you walk to the end of one of the piers by the ferry terminal, you should be able to get a clear view of it from land. I lined up to get on board the ferry at about 8.45 am and by 5 past 9 it had set sail. The day was sunny, but there was a strong wind blowing. As the boat set off and the island came into view, I remember thinking about the escape attempt made in June 1962 as immortalized in the Clint Eastwood film “Escape from Alcatraz “. It really didn’t seem that improbable that at least one if not all of the real life escapees , Frank lee Morris, or one of the Anglin brothers could have made it to freedom. No bodies were ever found, and although the water is dangerously cold, if your life depended on it, maybe you could go the distance. It is of course a lot easier to speculate about their success, on a early morning tourist boat then being an escaped convict in those dark cold waters, but their incentive was much greater then the average person. But as we may never know what really happened to them, this has just become another legend to be added to the growing number that surround the Island. As you draw closer, and prepare to dock, the first thing you will notice is the warning sign and the graffiti around it saying “Indians welcome”. This relates to the occupation of the island by American Indians in the 60’s as part of an organized political protest that continued for 19 months. American Indians were also responsible for the belief that the haunted Alcatraz Island was itself an evil place long before the prison was built, and they believed it to be cursed. As you disembark, you are greeted by several of the park rangers. There are a few gift shops where you can get your Alcatraz guidebooks and souvenirs. Behind the landing dock in front of you, you can see what used to be the barracks, and above them there are a further two levels to the island. At the very top is where the cell blocks are, and next to them are the now ruined warden’s house, and the still intact Alcatraz lighthouse. The rangers on the lower level provide a informative 15 minute talk on the history of the island at regular intervals, and you also have the opportunity to ask them any questions, before you set out. After a few minutes I decided to head off by myself. This was done to avoid the crowds that would soon follow. If you want to experience the true atmosphere of the cell blocks, come early in the morning and head there first. You can always backtrack to other parts of the island later. You will find most people work their way up in a more logical route, so if you start at the top of the island and work backwards you can have much of it to yourself provided you go early on in the day. On the dock level there is a small but interesting museum that displays many of the accepts of life on Alcatraz including a section about Alcatraz ‘s myths and their reality’s. And if you step directly out through the little used side entrance, there is a long dark corridor part of which is closed off to the public. This is when you can start to imagine what life was like here before it became a tourist attraction. As you walk through the corridor and back out into the daylight there is a long slopping path that takes you up to the second level of the island. Ahead , you will notice a what may be a familiar looking water tower. It was prominently featured in another Clint Eastwood film, Magnum Force. This is not the original tower that used to supply the prisoners, but it was actually recreated just for the movie. At this point you will also begin to notice what incredible views to San Francisco and the Bay Bridge that the island has. If you were looking at them from a luxury condominium it would have cost millions. But although the scenery was free for the prisons inmates, it must have just added to the sense of isolation knowing that the city lights would for them, always be just out of reach. You would have been locked in a 9ft by 5ft prison cell, thirteen hours at a time, with a 20 minute lunch break and much of the rest of the day spent in the prison workshop. Your only companions, would have been murderers, rapists, kidnappers and brutal prison guards. And this same regime would continue day after to day for years at a time, with little hope of escape or parole. As you walk higher up the main path you will notice that some of the buildings are little more then ruins, while others are almost perfectly preserved. Today many are used as storage facilities or offices for the islands staff. Alcatraz was at one time a city in itself. Covering 22 acres that included living quarters for the prison guard population and their family’s, workshops, laundry rooms, a recreation area and a hospital. 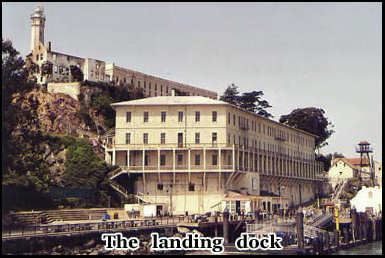 The landing dock could even at one time accommodate prisoners that arrived by train. Special carriages carrying inmates from other parts of the country would be transferred from railway to barge, and then towed across the bay to be unloaded. After about 15 minutes uphill walk, I was one of the first people to reach the top of the island. Instead of heading straight to the main entrance of the cell blocks, I came across the entrance to the prison shower rooms. According to reports this is one of the most haunted parts of the island. 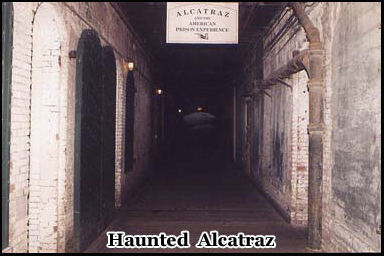 Rumors of the ghosts that walk haunted Alcatraz are not a recent phenomenon. There are accounts dating back to the 1940’s whereby a prisoner locked in solitary confinement was heard screaming that something with glowing red eyes was in his cell . His pleas were ignored, and legend has it that the next morning he was found dead. 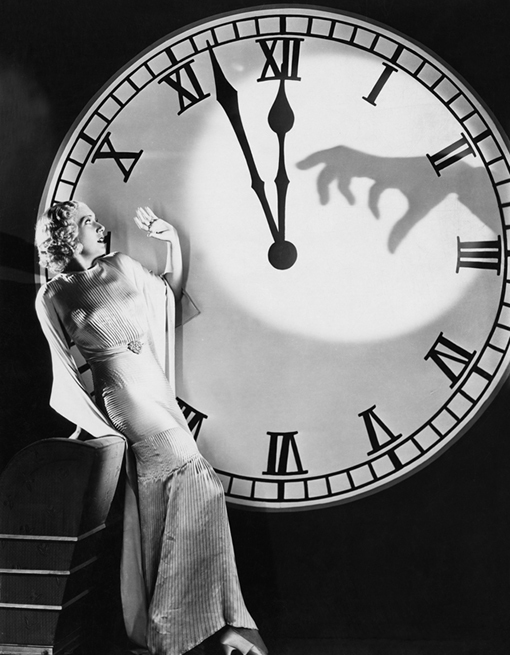 Over the years, unexplained gunshots, explosions, and the sounds of people screaming have all been reported. 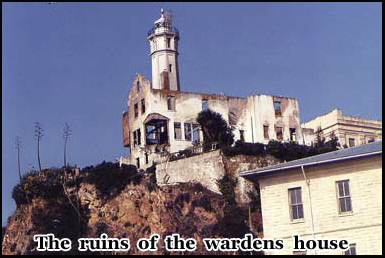 Dark shapes have been seen, cold spots felt throughout the prison, and even the appearance of the original lighthouse has been reported, although long demolished. More recently the paranormal occurrences at the island have been featured on C.B.S, the Sci-fi channel, and the History channels Haunted History series. As I headed down the narrow stairs into the shower room, the whole atmosphere changed. As your peer ahead into the gloom, you do wonder what was below. There was absolutely no one else in the building. Most of the other visitors were still on the islands lower levels. As you walk down the stairs, everything becomes very quiet. The showers themselves are no longer there, just a few rusted pipes and concrete support beams. There are a few barred windows that let in little light. Above and behind you are the heavy iron prison doors. The flash from the camera, throws up all sorts of strange shadows. I stood there for about 10 minutes, before heading back to the main entrance of the adjoining cell block. From the path in front of the building I could see the second of what would be dozens of tourist’s boats approaching the dock. It was about 10.30 am and by midday the island can become overrun with visitors and lose much of its atmosphere. Up ahead to your left hand side you will see the remains of the warden’s house, almost directly next to the entrance of the main cell blocks. This is where you have some of the best views from the island. And it is also the site of many reported hauntings. It was once the home of Warden James A Johnston the first warden of the prison. He lived there from the 1930’s until his retirement, and claimed to have heard the unexplained ghostly sounds of a women sobbing in the prison dungeons. The figure of a man dressed in a grey suit has also been seen among the ruins that are now little more then a burnt out shell. It was Warden Johnson that was responsible for turning Alcatraz from a military prison into a maximum security facility adding gun towers, upgrading the cells locking systems, and ensuring that eventually there was one guard for every three prisoners. The remains of the Wardens house are now overgrown and derelict, and have a very strange feel about them. Next I headed for the cell blocks. They have self guided audio tours available, which make the experience much more interesting. Again, there were only a few people around and a large part of the time I would be the only person in the area. As you first enter the building you pass what was once the control center which once opened and closed the cell doors. Also in this section is the former visiting area, where convicts were allowed one visit a month from friends or relatives providing that had broken any of the prisons rules or regulations. There are actually 4 cell blocks, A B C and D. D block was used to place prisoners in solitary confinement. As you would expect, everything had a cold clinical feel to it. But it was exciting to know that you were wa lking in the same footsteps as Al Capone, the Birdman of Alcatraz , and Pretty Boy Floyd. There are signs posted where some of the more famous inmates were said to have resided. Al Capone’s cell was number 14B. There are numerous black and white photographs of the inmates throughout the cell-block and you can stand in the exact place they once did, all those years ago. It was a very harsh regime. For the first several years the prison was opened a strict no talking rule was enforced, the few books or magazines you were allowed were censored so that few details of the outside world were disclosed. Visitors were forbidden from discussing current events with the inmates and all contact was strictly controlled. 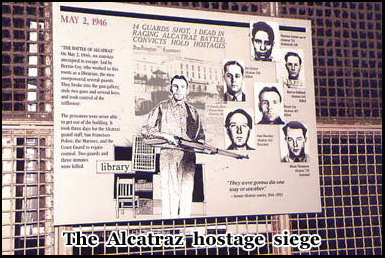 Although prisoners were not executed on Alcatraz , many committed suicide, were shot by guards during escape attempts, or had been killed in brawls with other inmates. I walked down the center isle between B and C blocks. This was referred to as Broadway by the prisoners. It is thought by many that violent acts can give off some sort of residual energy’s that can remain trapped in places many years after they have occurred. And there does seem to be a very oppressive feel around this and other areas throughout haunted Alcatraz Island. Walking on down B block you have the opportunity to sit in one of the cells, and close the heavy iron door for a few moments, but its hard to imagine what it must of felt like , if you knew that would be part of you daily routine for years to come. Half way along there is the very cell where the islands most famous escape attempt took place. 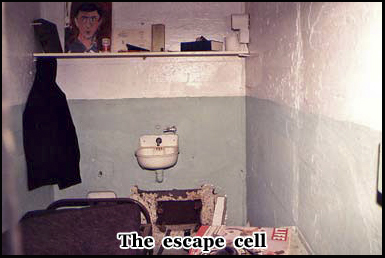 This is the one immortalized in the Clint Eastwood movie Escape from Alcatraz .The cell has been recreated to look like it did on that night in June of 1962, complete with dummy paper-mache heads made to fool the prison guards. The hole where one of the convicts tunneled his way though to the hollow wall behind is still there. I walked back up along block C to where a section of the end wall has been removed and covered with perspex, where it revels the path the convicts took on their way up to the roof. It is remarkable how small the escape hole is, and that they made it across to the other side of the island unseen. From there they were able to launch themselves into the water using a inflatable life raft made out of raincoats. After the escape was discovered the next day, some of their personal effects were found floating in San Francisco bay. But not their bodies. 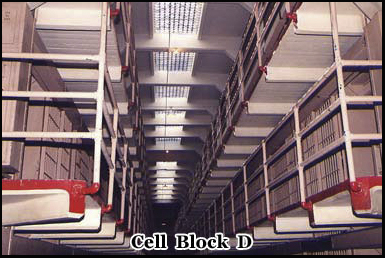 I walked further along between cell blocks B and C and looked up to the second row of cells to the one saying 14B. 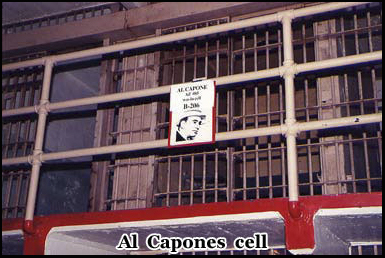 There is a plaque there saying that it was once the cell where Al Capone was imprisoned. I kept on walking towards the end of the cell block. If you glance above you at the perimeter fence you can see can see where the holes for the gun turrets were. None of the prison guards on the floor where allowed to be armed to avoid the weapons being used by prisoners if they were attacked by them. At the end of cell block C there is a large clock, in keeping with the Broadway theme, this was referred to as time square. Here is where three times a time, the prisoners were a assembled before having either breakfast lunch or dinner. As you enter the dining room, you can’t help thinking of one of those old prison movies whereby the inmates start rioting and throwing food at each other. The original breakfast menu is on display on a board by the serving hatch. The day I was there, it read 21st march 1963 assorted cereals, steamed whole wheat, scrambled eggs, fresh milk, stewed fruit, toast bread, butter coffee. If you backtrack out of the dining room there are stairs to the prison hospital at the end of cell block C. This is also one of the areas where the hauntings are most active. If you go down the stairs, there are the remains of what once was the prison hospital the walls are in considerable decay, and there are only a few artifacts left from that time, including a wheel chair and an operating table. Conditions seem to be very crude compared to today’s standards. Many prisoners died of disease and injury on haunted Alcatraz island and without doubt this is where many of them must have spent their last moments. I was the only one down in the area at this time and it is a very quiet and forbidding place. I walked around the hospital for a few more minutes and went back up the steps to cell block D.One thing that struck me about the entire cell block area was that I had expected it to be bigger. But although the entire prison site is almost 22 acres, Alcatraz only ever held just over 1500 prisoners during its time as a prison. In the end the cost of this for such a relatively small number of inmates was one of the primary factors in its closure. Cell block D is the area used for solitary confinement, and the cells are not barred but are actually solid so if shut inside one of them, you wouldn’t be able to hear or see anything. It is in between D and C blocks where one of the prisons most infamous events occurred, and D block cells 12 and 14 have been the locations of many supernatural occurrences. At the end of the block in 1946 several guards were taken hostage in one of the cells during an escape attempt. There is a plaque there that describes the event. Three of the escaping convicts were shot dead when marines and prison guards stormed the cell block. But not before one of them, Joseph Cretzer, started to shoot the hostages killing one of them and injuring several more. As a result of the siege another two of the participating inmates were later tried and executed. If you move around to cell block D you can go and sit in cell 14D and close the door. This I did, and it is an unpleasant experience, even for a few minutes. The actual inmates were often kept in here for up to 2 weeks, confined to these dark dank cells 24 hours a day, only allowed into the outside world once a week for a twenty minute shower. Is it possible, that the negative energy’s of what were very evil men, could still linger here on haunted Alcatraz long after they have left. Once you open the heavy cell door , in contrast you can gaze out of the windows near the adjacent library onto what are very spectacular views of San Francisco . But I’m sure on dark mist filled winter days they are not quite as inviting. Especially if your looking at them from one of the upper cells on D wing. By now it was almost midday and there were now probably thousands of people on the island. My last stop was a quick walk down the other steps at the end of D block down into the recreation yard. At times the mist around the island would get so dense that the yard couldn’t be seen clearly by the guards and so the inmates were confined to the cells. But at other times they would play softball or card games out here in the sunshine. I sat outside for a few minutes looking at the view from behind the surrounding fence. I didn’t see any ghosts today, but I would highly recommend coming here. I believe they now do night time haunted Alcatraz tours of the island which would probably be even more atmospheric and I hope to attend one, when I return to San Francisco in the near future. Hey Buddy!, I found this information for you: "Haunted Alcatraz Island – San Francisco". 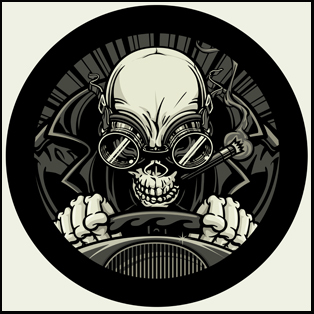 Here is the website link: https://www.chasingmidnight.com/haunted-alcatraz. Thank you.